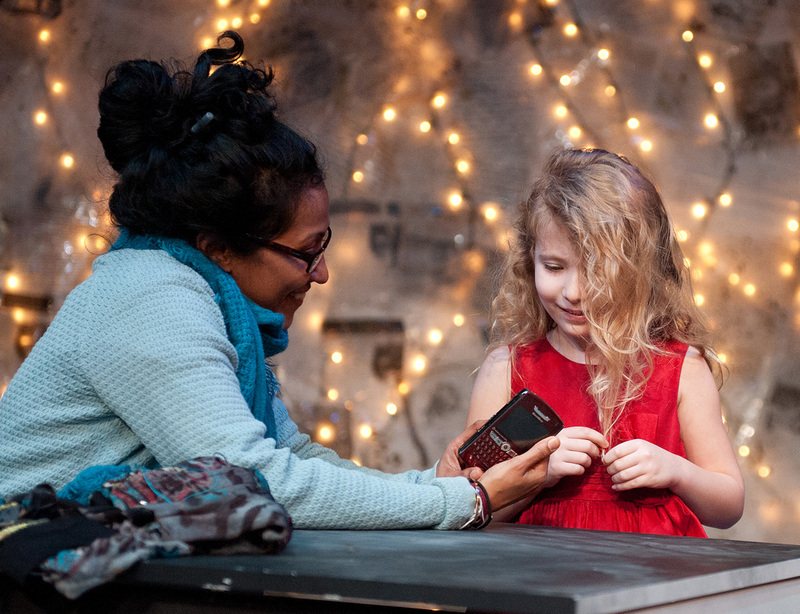 On a dreary cold afternoon in Manhattan, I took my two 13-year old daughters to see a sparkly, “You Are Now the Owner of This Suitcase,” a magical play by a team of writers about a place in the world that is the exact opposite of the place where I grew up. We did not have diversity in Park Ridge or in our class of about 800 at Maine South High School. The one African American kid was actually African, an exchange student from Kenya. There was one Jewish family. No wonder I love diversity. I love it beyond words can explain. And I love that this play loves diversity. “I think I now know about 20 different ways of saying, “I’m looking for a beautiful woman new to the city,” says Joe, one of the dozen characters who wander on the stage on a quest. He is looking for the owner of the suitcase. 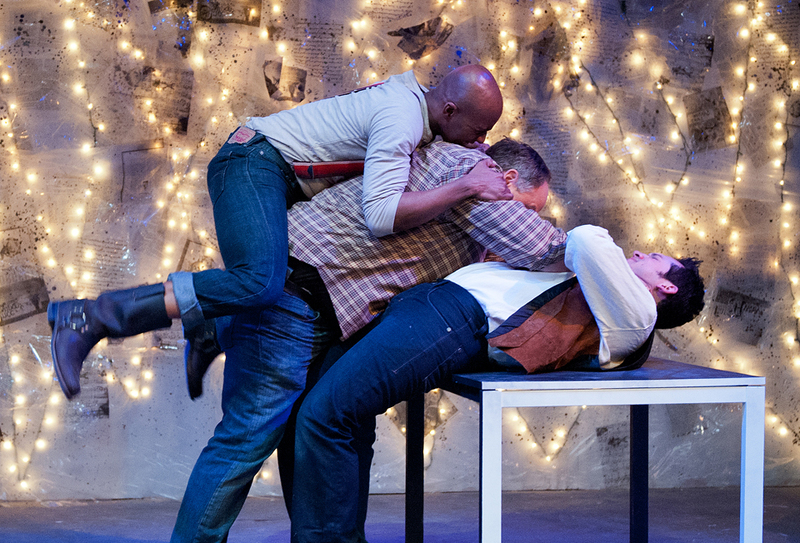 This play, “You Are Now the Owner …” is the middle play of the Jackson Heights trilogy, a microscope on diversity and a kaleidoscope of racial and ethnic community. This is magical realism with a contemporary ‘tude. Characters jump from a storybook. A cell phone turns into a girl. With so many storylines, I lost the thread of plot at times, but I was just happy to be with my girls and to be transported, taking a trip, like that suitcase. ROSA: As a rose petal falls and the rain feeds the underground, my love will remain true to the one that grants me my soul through and through. TOMÁS: That makes you guys soul mates. Ah that’s nice. They make their way to the book. ROSA crawls in. TOMÁS looks around. TOMÁS: Man, this place may not be a fairy tale. But love does live here. The play is a multi-culti mish mosh, just like the borough. Just like New York City. My favorite character was Salim, the fast-talking cell phone salesman. His shop seemed to be the hub upon which the whole world spun. I said, “The play celebrated diversity.” Like David Dinkins always said, “New York City is a beautiful mosaic.” And so was this play. “You Are Now the Owner of This Suitcase,” was conceived by Ari Laura Kreith and written by Mando Alvarado, Jenny Lyn Bader, Barbara Cassidy, Les Hunter, Joy Tomasko, Gary Winter, Stefanie Zadravec. I think the show has closed now, but like a suitcase in your closet, I hope it opens again soon and transports you somewhere warm and diverse and teeming with interesting and eccentric characters to enchant you. After all, this is spring break! You deserve such a nice break. < Previous Is the Pope Better Than You and Me?